Thank you so much for this book. I had a chance to read it this weekend and liked it very much. I am sure there were many things that the soldiers were not telling their loved ones at home. It seems that many of the letters focus on things back home and keeping it light so as not to worry the family. My husband, Jeff's dad was born in 1925, so he also joined up when he finished high school. Jeff doesn't remember him ever talking much about anything though. I am sure many men did not and there were many things that they did not want to remember. I watched Jim Markson's video interview on the Support Our Troops page and I am very impressed in what he stated. Alot of memories came flooding back, as I look back to my time in ‘’ THE NAM ‘’. 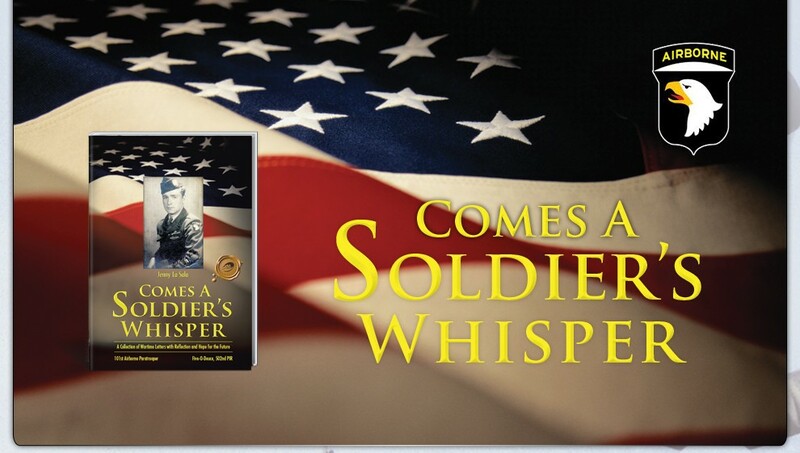 I started and just finished reading 'Comes A Soldier's Whisper', straight through, as I couldn’t put it down. Very interesting and enjoyable and easy read. Just a little note from Emma to say, she read the book and it is very moving. It is a book full of emotion and we can just not believe where and what your dad and others must have gone thru in this war. He sure is a hero, doing this for the freedom of people in country’s he did not even know. You can be proud of him and of yourself for writing this book. I have finished the book of letters written by your dad during WWII. But I have to go back and read it again slowly and underline what I believe to be the highlights that I related to as a Vietnam veteran from 1968... I think it's a terrific story. Thank you for your father's service to his country. I've often thought about having my father's ideas/notes/memories published, and I think what you are doing is great. We found your book inspiring…the bond between your mother & father was an extremely strong and trusting relationship. It's amazing how the support of these letters, being solely written by your father, gave an insight as to what your mother was going through back home. She supported his effort by writing as well as keeping in touch with his family which is the greatest comfort for a soldier overseas who is coping with war. Anyone who reads this book will be impressed by all the medals and honors your father accomplished. He certainly is a hero. Not only was your father a hero but your mother as well. She sold US savings bonds back here in the United States during the entire war. I'm glad you wrote this book. it will give you peace of mind and help others to know and honor families of all generations who have to endure the hardships of war. Thank you for sharing. Looking forward to future stories and books. The book is beautiful, I can’t tell you just how impressed I am. Your ability to share is amazing. This book will give his grandchildren an insight to their grandfather that most grandchildren will never have. I finished reading your book and enjoyed it very much. Like the subtitle of the book, it really is about reflection and hope for the future of a GI and his girl in WW2. It is very interesting to understand what the greatest generation went through at the time, both at home and at the front. I especially liked your dad's observations about his pride of being in the paratroopers and his willingness to stick with them, even though he feared he could not take it much longer. Also interesting observations about strikes at the homefront, integration, Germans and the point system for rotating back. Being interested in military history, I also hoped for more of that but letters home seldom mention military matters. I believe your dad entered 1944 instead of 1945 for his January letters on pages 17, 21, 22, 23, 25 and 28. He was not used to writing '1945' in the beginning of a new year. I can tell because he is in Belgium and writes about combat situtations. In January 1944, he was still in England as the European mainland had yet to be invaded on June 1944. I also learned your dad was wounded in Holland at the same time his regimental commander was wounded. It is also on page 330 of our book, ORANGE IS THE COLOR OF THE DAY, pictorial history of the 101st Airborne Liberation of my country, Holland. Although I did not know that your dad was among the ones that were wounded, I would have mentioned his name as well, of course. I was able to determine the general area where that tree burst happened; it is in the book. (This tree burst is also mentioned in the 101st Division historybook, titled "Rendez-vous with Destiny", although your dad is not mentioned by name, he was there). Again, good luck with your book. I enjoyed it very much to discover the young civilian behind the tough paratrooper. A great story! I have enjoyed your very personal and beautifully written letters from your father to your mom. I am sure that many people will enjoy reading these insightful letters. It was a real emotional journey that you took us on by sharing these letters. It must be very difficult for a soldier to return from a group and life style where he served an important function for his country. A soldier is in charge of others and has a built in family of peers. Then he returns to life back home. His family functioned without him. His kids are busy. His spouse has been handling everything. Now he is told to find a place back home. I really never knew people in the service. My father wasn't in the service. My brother wasn't in the service. My friends were not in the service. It is nice to read about what people go through. It opens my eyes to many things that I don't relate to.